Pakistan on Wednesday began burying 132 students killed in a grisly attack on their school by Taliban militants that has heaped pressure on the government to do more to tackle an increasingly aggressive Taliban insurgency. The authorities, long accused of not being tough enough on extremists, quickly pointed the finger at Afghanistan, suggesting the neighboring nation was not doing enough to catch Pakistani Taliban commanders hiding on its territory. People across Pakistan lit candles and staged vigils as parents bade final farewells to their children during mass funerals in and around Peshawar, the volatile city on the edge of Pakistan’s lawless tribal belt. Anger mixed with the grief as people looked to the authorities to act decisively. In an apparent response to public opinion after what may have been the deadliest militant attack in Pakistani history, Prime Minister Nawaz Sharif announced he had lifted a moratorium on the death penalty. 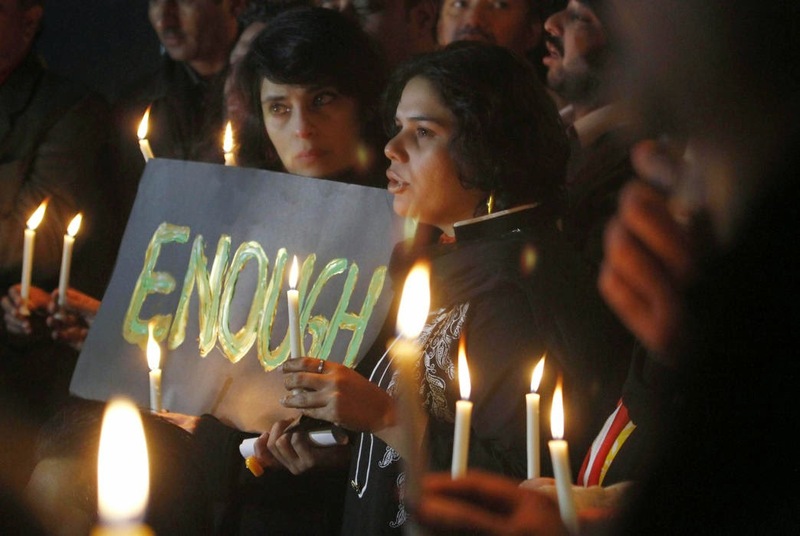 At a vigil in the capital Islamabad, Fatimah Khan, 38, said she was devastated by the atrocity. Sixteen-year-old Naba Mehdi, who attends the Army School in the nearby garrison city of Rawalpindi, had a message of defiance for the Taliban. The focus was on Army Chief Raheel Sharif as he visited Afghanistan, where the two sides – whose relationship is strained after decades of mistrust – discussed how to crack down on militants hiding on their common border. A Pakistani source, speaking on condition of anonymity, said the army chief had asked the Afghan side to help catch and hand over Pakistani Taliban Chief Mullah Fazlullah, who is hiding in the lawless mountains on the Afghan side of the frontier. “It has been our long-standing demand,” the senior military official told Reuters. “And if Afghanistan does not help us then we have other options, including the option of hot pursuit.”He added the army chief went to Kabul with “incontrovertible evidence” that the attack was masterminded in Afghanistan. There was no comment from the Afghan side but another Pakistani source said Kabul had responded positively to Pakistan’s requests and praised new Afghan leader Ashraf Ghani’s efforts to cooperate more on security. Pakistanis may be used to almost daily attacks on security forces but an outright assault on children stunned the country, prompting commentators to call for tough military action. In all, 148 people were killed in the attack on the military-run Army Public School, according to the army. The school’s sprawling grounds were all but deserted on Wednesday, with a few snipers manning the roofs of its pink brick-and-stone buildings. Army vehicles and soldiers wearing face masks and carrying rifles were deployed by the entrance. A Reuters tour of the school revealed a place shattered by hours of fighting, its floor slick with blood and walls pockmarked with bullet holes. Classrooms were filled with abandoned school bags, mobile phones and broken chairs. One wall was smashed where a suicide bomber blew himself up, blood splattered across it. His body parts were piled nearby on a white cloth. The air was thick with the smell of explosives and flesh. A day after the attack, Peshawar was subdued as people digested the tragedy. More details of the well-organized attack emerged as witnesses came forward with accounts. “The attackers came around 10:30 a.m. on a pick-up van,” said Issam Uddin, a 25-year-old school bus driver. Sharif has announced three days of mourning, but people’s anxiety focused on what the authorities can do to protect them. Sharif came to power last year promising to negotiate peace with the Taliban, but those efforts failed, weakening his position and prompting the army to launch an air-and-ground operation against insurgents along the Afghan border. Despite the well-publicized crackdown, the military has been accused of being too lenient toward militants who critics say are used to carry out the army’s bidding in places such as the disputed Kashmir region and Afghanistan. “People will have to stop equivocating and come together in the face of national tragedy,” said Sherry Rehman, a former ambassador to the United States and an opposition politician. In a show of unity with a government he once tried to oust, opposition politician Imran Khan said he was calling off his months-long protest movement against Sharif – a welcome relief for a prime minister already beset by growing domestic problems.